I loved my Mazdaspeed3 ... It wasn't a bad car at all especially for the price. The new ones are even better (style aside). But really the Miata and the Mazda3 keep that brand going. The CX9 is a good SUV apparently but there aren't really any other products other than the first two that I mentioned that are best in class. Sorry for having a bad taste in car design. 1st gen speed3 owners call it GenPu. 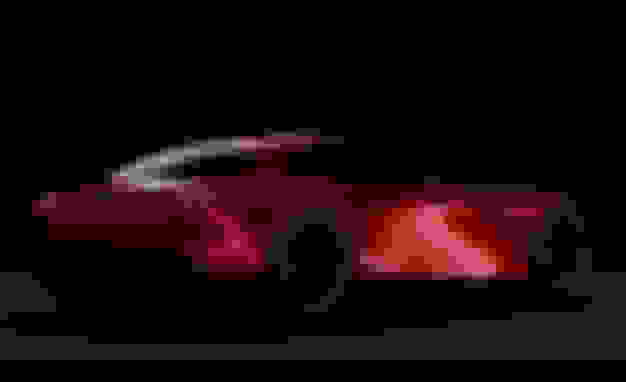 The audio sounds like the background to a James Garner TV montage, but the visuals are pure cutting-edge Mazda design. Wrapping the Kodo design theme around a compact three-door hatchback model, the video gives us an idea of what the next Mazda2 or Mazda3 could look like. While we're big fans of the driving, features, and overall value of the current Mazda2 and Mazda3, those smiley faces can get a bit tiresome. Particularly on the fish-gilled grin of the 2010 Mazdaspeed3. Fortunately, that particular design feature is much improved with a more angular, aggressive and decidedly less cheery look with the Kodo theme. For more on the Kodo theme, be sure to check out Mazda's Shinari Concept if you missed it the first time around. The new car is the design study for the coming generation of Mazda's vehicles, much like the Nagare has been until the Shinari's arrival. 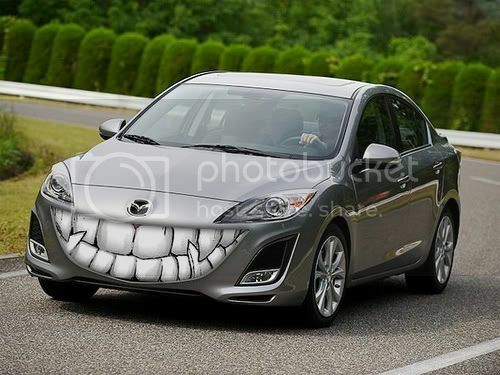 What's with Mazda and wanting to put a "face" on the front end of their cars??!?! ^ Um...BMW is just as bad. Worse IMO...their cars all have this look. ^^ Interesting....post said BWM "face"....I've never noticed it. Coincidence or not, it just seems quite a few Mazda's have a "face".....weird. Quite an evil face that is. Mazda's sales in the United States this year have not quite kept pace with the overall U.S. market. The automaker's sales are up 9% to 174,770 vehicles through September, compared with the industry's 10% advance. But CEO Takashi Yamanouchi sees big growth around the corner. Over the next 5 years, he expects U.S. sales to double to 400,000 units. In the meantime, Mazda is grappling with the yen's surge against the dollar and uncertainty about its longtime partner, Ford Motor Co., which is widely expected to further cut its holdings in Mazda. Ford's stake has dropped to 11% today from 33% in 2008. In April, we announced a midterm framework looking 6 years ahead. We now have global sales of 1.2 million units, and the outlook takes us to 1.7 million units. In the United States, we are looking to double the current level of 190,000 to 200,000 units to around 400,000. Up to 3 years ago, we put our incentives at a level close to U.S. domestic brands. But right now, our incentives are low even among the big Japanese makers. When we have a product that incorporates the full SkyActiv technology, it will probably have fuel economy comparable to a hybrid vehicle. So whether we price at the same level as a hybrid or not is something that needs to be given careful consideration. It will provide us with huge opportunities. By 2016, about 80% of our products will incorporate SkyActiv products. We'll go through a full-model cycle for nearly our whole lineup by then. The media try to portray a change in the capital relationship as meaning the 2 car companies are going their separate ways. But 4 years ago, Mazda and Ford had talks where it was agreed Mazda would pursue SkyActiv, and Ford would pursue EcoBoost. So that's 2 years before November 2008, when Mazda was still an equity-based affiliate of Ford. 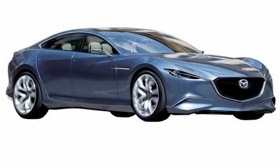 After 4 years of hyping its curvy, fluid Nagare styling philosophy--but developing only one production vehicle with the look--Mazda has changed design course. The Shinari look will begin to appear on production vehicles within 2 years, says Derek Jenkins, design director for Mazda North American Operations. What happened to Nagare? It went out with global design director Laurens Van den Acker, who developed the look but moved to Renault last year after a 3 year stint with Mazda. The redesigned 2012 Mazda5 minivan that goes on sale in January is the 1st production vehicle to incorporate the Nagare design ideas. It will also be the last, Jenkins says. Jenkins, 40, oversees Mazda's North American design studio, about an hour south of Los Angeles in Irvine, Calif. The studio is 1 of Mazda's 3 global design centers. The U.S. studio competes with counterparts near Frankfurt, Germany, and in Hiroshima, Japan, to come up with exterior and interior designs for production vehicles. For example, prior to Jenkins' arrival at Mazda in 2009 the U.S. studio had a hand in designing the current Mazda3 and Mazda6 sedans, as well as the CX-7 and CX-9 crossovers. The low-slung 4-door Shinari concept, which looks more Aston Martin than Miata, embodies kodo, Japanese for "soul of motion," Mazda says. Jenkins says the transition from Nagare to kodo is more evolution than outright change in direction. Flowing lines and the emphasis on the "face" of new vehicles--the configuration of the grille, headlights and fascia--will continue with the kodo philosophy. Jenkins says the company also wants to improve its interiors--aluminum trim, for example, rather than surfaces painted to look like brushed aluminum. Mazda is racing to boost its U.S. market share to 2.5% and sales to 400,000 vehicles by 2014. The ambitious goal -- a 74% gain over 2010 U.S. sales of 229,566 units -- would be a milestone for the company. Mazda has never sold 400,000 vehicles in its nearly 40 years in this country. And the company faces significant obstacles. For instance, Mazda is highly vulnerable to the profit-punishing strength of the Japanese yen. Japan-made vehicles account for 85% of its U.S. sales. Davis says consumer-facing marketing spending for Mazda's fiscal year ending March 31, 2012, is up 19% from the previous year. Spending is expected to grow another 9% the following year, Davis says. In calendar year 2010, Mazda spent $198 million in the United States, according to Kantar Media via Advertising Age. That represents a 29.8% increase over 2009, when Mazda spent $152 million. Advertising Age, like Automotive News, is published by Crain Communications. The product push is noteworthy: The vehicle platform and powertrains set for launch are the 1st to be developed solely by Mazda in decades. The approach can cut development costs by 20 to 70% per vehicle, depending on the segment and the number of components that can be shared from other vehicles, Sori said. "Not a lot of exclusive stores -- probably the worst in the industry; initial quality was not all that robust; residuals were low; incentive spending was high; and owner loyalty was 1 of the worst, if not the worst, in the industry," O'Sullivan said. But the company has made strides in most areas. Mazda vehicles jumped from 2nd-worst in the 2005 Initial Quality Study to 5th-best in the 2011 study, according to J.D. Power and Associates. Mazda kept 37% of its customers within the brand last year compared with about 23% in 2005 -- the second-worst rate in the industry at the time. A sign of growing dealer focus on Mazda: Half of Mazda's 640 dealerships are exclusive, compared with less than 25% in 2003. You can reach Ryan Beene at [email protected]. It seems like just about every car CEO has some huge volume increase planned for the next few years. For Mazda I hope it works since they no longer have a partner to shoulder the development costs and it needs that volume to survive. I must be tired bc I thought that the title of the thread was "Mazda: FUTURE (as in news)" & not "Furai". My bad. Maybe there is an alternative to batteries when it comes to storing energy and saving gas in cars after all. Mazda is about to find out. Engineers have talked about using capacitators instead of batteries for a while, but no automaker indicated it was ready to take the bold step. Now one has. It's Mazda in Japan, which is annouced it has found a way to store eneergy from regenerative braking in a capacitator, instead of having to lug around heavy batteries, in a move that will save about 10% on gas. Mazda is calling it i-ELOOP and it will start showing up on vehicles next year. Besides being lighter, capacitators, an electrical component that temporarily stores large volumes of electricity, can be charged and discharged rapidly and are resistant to deterioration through prolonged use. The energy stored in Mazda's capacitators won't go into acceleration. Rather it will be used for electrical systems like climate control, audio and numerous others. Regenerative braking systems are common on hybrids. They use an electric motor or alternator to generate electricity as the vehicle decelerates, thereby recovering a portion of the vehicle's kinetic energy. Regenerative braking systems in hybrid vehicles generally use a large electric motor and dedicated battery. The i-ELOOP system will use new 12-25 volt variable voltage alternator, a low-resistance electric double layer capacitor and a DC/DC converter. 'i-ELOOP' starts to recover kinetic energy the moment the driver lifts off the accelerator pedal and the vehicle begins to decelerate. The variable voltage alternator generates electricity at up to 25V for maximum efficiency before sending it to the Electric Double Layer Capacitor (EDLC) for storage. The capacitor, which has been specially developed for use in a vehicle, can be fully charged in seconds. The DC/DC converter steps down the electricity from 25V to 12V before it is distributed directly to the vehicle's electrical components. The system also charges the vehicle battery as necessary. This sounds like the eAssist mild hybrid GM is using but getting a 10% mileage gain by just moving the electrical load to the capacitor seems a bit optimistic. Having languished for decades in a crowded field of mass-market nameplates, Mazda will reposition itself as a more premium brand, Mazda Motor Corp. CEO Takashi Yamanouchi said. "The question is: In the global market, what is the significance of a player with a mere 2%?" Yamanouchi told Automotive News last week. "It's something we frequently discuss internally. We came to the conclusion that if we make ordinary cars for the mass market, there is no reason for us to exist." Yamanouchi, a soft-spoken former purchasing executive, wants to boost sales in Mazda's biggest, most important market by 43% to more than 400,000 U.S. units by the fiscal year that ends March 31, 2016. To get to that record level, Mazda will launch a flood of products over the next few years using an upscale brand image. Internally, Mazda is calling its brand shift "Japan premium." That term will not be used in marketing. But the strategy is to leverage Mazda's new technologies and styling to lift the company above its Japanese rivals and other mass-market brands. Some Mazda insiders see the move as the only way Mazda -- a tiny, financially strapped brand with global sales of just 1.3 million units -- can survive. The 3rd-generation Mazda6 mid-sized sedan, which hits U.S. showrooms in January, will lead the upswing in sales and brand identity. At the car's launch in Japan last week, Hirotaka Kanazawa, Mazda's global r&d chief, used the term "Japan premium" for its brand positioning, comparing it with German luxury marques. Mazda's products, exemplified by the redesigned Mazda6, will be packed with cutting-edge environmental and safety technologies and upscale interior materials. The company's new lineup of Skyactiv technologies will underpin the shift. They encompass a range of chassis, platform and drivetrain systems that save fuel and boost performance. The Mazda CX-5 compact crossover, which was launched in the United States in the spring, was the 1st vehicle completely remade using the Skyactiv blueprint. Next comes the Mazda6. By 2016, 80% of Mazda's lineup will employ the suite of Skyactiv features. Mazda is betting the technologies will not only set it apart but enable it to charge more and protect residual values. "This is a 1st step in going toward premium," Yamanouchi said. "It's about being a brand that has a strong bond with the customer." • Mazda's new kodo design language, which debuted in the CX-5 crossover. In Japanese, kodo means "soul of motion." • More attention to customer service at dealerships. • Active safety systems such as precrash warning technologies. • Diesel drivetrains that are clean and powerful. • Minimized incentives and maximized residual values. "That's how we aim to be like a premium," Yamanouchi said. "Broadly speaking, it is not to rely on discounts but to have consumers appreciate the value of the product." Kanazawa said: "With each and every feature and function, we want customers to experience" something "that is well-designed and easy to use." Mazda is banking on a bevy of products, including redesigns of the CX-9 crossover and Mazda3 sedan. Also coming is a new roadster jointly developed with Alfa Romeo to replace the MX-5 Miata. The emphasis is on North American production and U.S. sales. A year ago, Yamanouchi said Mazda was looking at reducing the 400,000 target for fiscal 2016. He has since revised his target upward. "At least 400,000 units," Yamanouchi said of the new U.S. sales goal. "It's a significant jump from current levels." Mazda is forecasting 280,000 units for the current fiscal year that ends March 31. U.S. sales climbed 9% to 228,104 units through October, but the market rose 14%. A $500 million factory in Mexico will start producing vehicles in early 2014 and will ensure that Mazda has plenty of local capacity to support the increase without being hit by the exchange rate losses it faces from importing cars from Japan. The plant's capacity, for 140,000 Mazda2 small cars and Mazda3s, will be on top of what is already coming out of Japan -- not a substitute for it, Yamanouchi said. "In the near future, I think we can make an announcement that increases the capacity of that plant even further," he said. Brand appeal is critical to the successful repositioning. Yamanouchi points to Mazda's ranking in Consumer Reports' predicted-reliability study as 1 sign that the brand's value is making a difference with consumers. For the 2nd straight year, it ranked No. 4 of 28 brands -- this time behind Scion, Toyota and Lexus. Mazda wants dealers to up their game for a share of the spoils. Despite the predicted 43 percent boom in U.S. sales, Mazda doesn't want more U.S. dealers. The goal: Fatten existing dealers' earnings so they will invest more in their stores. Said Yamanouchi: "We don't intend to increase the number of stores." This sounds like the Tier 1 talk from Acura not too long ago. We can't compete with mass market so we'll try to go upmarket instead. Not sure how well that'll work for them. I don't think it is going to end well for them. Mazda makes good cars in a very competitive market. Zoom Zoom is over ... They need to get bodies into their showrooms. The Koreans came, wanted to be Toyota +.......they achieved that and so much more. Kia and Hyundai became leaders in many segments. Small Japanese player Mazda never saw it coming. There have been numerous reports and official hints that Mazda could launch a rotary-powered sports car to either celebrate the 50th anniversary of its first rotary-powered model in 2017 or its own centenary in 2020. Now, the automaker’s CEO has put an end to the speculation. Speaking with Automotive News (subscription required), Mazda CEO Masamichi Kogai said he has no plans to launch a new rotary-powered sports car, quashing any hopes of a revival of the RX-7 or launch of a new RX-9 flagship. "We don't have that kind of vehicle in our future product plan," Kogai replied when asked about a new RX. "If you increase the number of segments, then the resources we can allocate to each will decline and that will prevent us from developing truly good products." Instead, Mazda will focus on shoring up its finances and investing its limited resources on improving its fuel-saving Skyactiv technologies as well as launching models in higher volume segments. Mazda has just launched new versions of its 2 subcompact and MX-5 sports car, and at next week’s 2014 Los Angeles Auto Show it’s set to introduce a new CX-3 subcompact crossover as well as updated versions of its CX-5 and 6 models. Beyond these, Mazda will also have to renew its 5 and CX-9 models, which are yet to receive the Skyactiv treatment. Mazda will also have to invest heavily in much more fuel-efficient technologies or risk falling behind rivals, which have much bigger R&D budgets. Kogai revealed that the automaker is working on next-generation Skyactiv technology that could debut around the end of the decade. Dubbed Skyactiv 2, engineers are targeting economy gains of around 30 percent compared with current levels. One area of focus is said to be sparkless ignition tech for gasoline engines, otherwise known as homogeneous charge compression ignition (HCCI). The Wankel rotary engine has its issues, most notably with too many emissions, substandard fuel economy, and reliability. In fact, we just posted a video that explains these problems. But a rotary engine is also fun. It spins up quickly, offers good power for small displacements, and its light weight makes for great front/rear weight balance. If one automaker is associated with the Wankel, it's Mazda, even though the Japanese brand didn't develop it originally. Last fall at the Tokyo Motor Show, Mazda unveiled the RX-Vision concept, a design study that could foreshadow Mazda's next RX sports car. In Tokyo, Mazda said a production version of the RX-Vision would have rotary power, probably turbocharged. Mazda calls it SkyActiv-R, and says that the SkyActiv moniker represents the company's resolve in solving issues with rotaries. Now, it appears that Mazda really is working on a rotary engine, as the folks at Auto Evolution have uncovered a patent application for a rotary engine. The U.S. patent application is number 2016/0084158. Titled “Rotary Piston Engine Mounted on Vehicle,” Mazda submitted it last year and the U.S. Patent Office published it on March 24. The patent drawings show how Mazda may be dealing with some of the rotary's issues. Auto Evolution points out that Mazda is flipping the engine over, putting the intake at the bottom and the exhaust at the top. The turbo is mounted on the exhaust outlet, giving the exhaust gases a very short trip to the turbo. That should improve performance, especially throttle response. As Motor Trend notes in its story on the subject, moving the exhaust outlet to that position is similar to V-8 engines with a "hot inside V" that features the turbos mounted within the engine's V.
Other stories have suggested that Mazda may electrify the Wankel, which would certainly be a way to make it more efficient. No matter how it returns, we want to drive it, especially if it's turbocharged and wrapped in the sensuous skin of the RX-Vision concept. 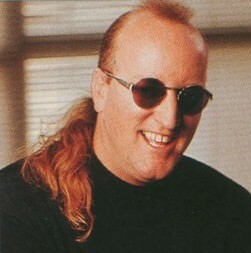 Just do it, Mazda. Turn the world upside down and put a rotary in an MX-5 already. That 400K units per year that the CEO wanted in 2010 didn't even come close - sales went up to better than in 20 years but the 2014 total was only 306K and only slightly better last year. Highly doubt we'll ever see a production Rotary Miata. As amazing as I'm sure it would be. More likely is the revival of the RX-_. I don't know why they praise that engine so much. I have only driven RX8 on the street and I wasn't liking it. I don't know how the turbo ones feel like, but NA was dumb. Rev to the moon to get going at all, and reliability is crap and expensive to fix since no one knows how to work on them. I've only ever driven a couple non-turbo FC/FD and 1 RX8. Fun cars, well sorted handling (the FC Convertible was a self-drifting machine). Very few moving parts (comparatively) & high revving. Loved screaming the RX8 through Bakersfield, CA without getting into trouble. One of the comparisons (RX8 criticisms) I read years ago about the RX put it like this: RX7 (assuming they meant turbo) competed with Porsches, RX8 with Mustangs. Bad on gas, engines have to use oil, bad on emissions, and they wear out fast. Rotary motors are the bomb for racing...but not a good idea for a street car. "Mazda has repeatedly teased—or tortured—Wankel-engine fans with the possibility of a multirotor sports car and then retracted that possibility. Now, new patent applications show the brand is once again working on the rotary, but in an application that’s likely to dash the hopes of the engine’s fans: using its iconic engine as an onboard generator, rather than the free-revving heart of a sports car." A homogeneous charge compression ignition (HCCI) gasoline engine has been something of a holy grail for internal combustion engineers for decades, promising the fuel economy of diesel engines but without the soot or nitrogen oxide emissions. This concept essentially achieves internal combustion through compression alone, without the need for sparkplugs, but reliable operation of these engines has eluded automakers. Until now. Mazda announced this week that it has solved the technical hurdles associated with this technology and that it plans to offer this type of engine, dubbed SKYACTIV-X, in its cars in the near future. "A proprietary combustion method called Spark Controlled Compression Ignition overcomes two issues that had impeded commercialization of compression ignition gasoline engines: maximizing the zone in which compression ignition is possible and achieving a seamless transition between compression ignition and spark ignition," the automaker said in a statement. Mazda's design will still use spark plugs to achieve ignition under certain conditions such as low temperatures, but it has indicated that all other issues pertaining to this design have been successfully solved, with the company touting the "super lean burn" characteristics of this new powerplant. The engine is expected to be 20 to 30 percent more efficient than its current SKYACTIV-G family of engines, and an impressive 35 to 45 percent more efficient than the automaker's own 2008 engine with the same displacement. Mazda's compression gasoline engine is promised to deliver 10 to 30 percent greater torque numbers than SKYACTIV-G engines, with Mazda planning to pair the new design with a supercharger. In addition, Mazda says that this new type of of engine will permit much more latitude in selecting gear ratios, which will benefit fuel economy. How soon will we see this new design in Mazda cars at the dealership? SKYACTIV-X engines are promised to appear in production models in 2019, but the automaker has not indicated in which models we'll see these engines first. The automaker also has not said if its HCCI engines will replace the current crop of SKYACTIV-G engines entirely or if Mazda will opt for a slow rollout of this technology. Mazda cautions that the engine is still under development and that the boosts in efficiency it has cited are rough estimates, but it maintains that its engineers have achieved a real breakthrough, one that points the way to the future of internal combustion engines at a time when many automakers are beginning to plan for an electric future. Interesting, wonder what the CR is on these. I know the SA-G engines are higher than average CR. Probably similar to the SA-D engines, though that uses a turbo and this a supercharger, which is interesting itself as that usually robs more power than a turbo.